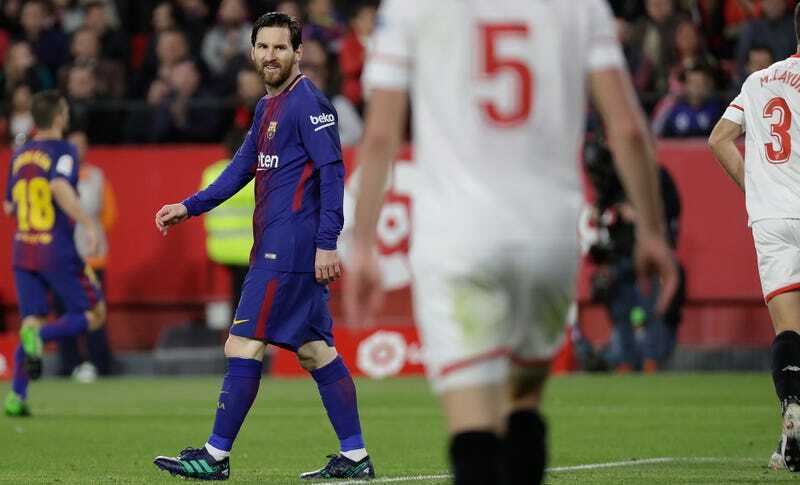 Lionel Messi came on as a substitute in the 58th minute of Barcelona’s match against Sevilla on Saturday with express orders not to run around too much. He obeyed, meandered around for the better part of his 30-minute cameo, before picking his moment and bursting forth from out of nowhere to score the game-tying goal in the 89th minute. He was given two instructions before the game against Sevilla because of his unspecified muscle complaints, which it seems is just fatigue. To not risk anything he was asked not to do long sprints and not to change pace very quickly. He did that, and in the 54 seconds between the two goals, if you watch him, he walks. After Luis Suarez scored in the 88th minute to to make it 2-1, Messi did his thing. You can spot him walking around in the upper part of the screen as the play develops and then see him come running in to blast a shot from outside the box. The Messi-inspired draw keeps Barcelona nine points above second-place Atlético Madrid, and just as importantly preserves their season-long undefeated streak in La Liga. Must be hard to stop someone who is still the best when he’s hardly even trying.